You can make a personal impact on the lives of those in your community by making a monetary donation or volunteering through UWCC. The aid you give stays right here in Comal County, making sure your good works benefit those closest to you. Please designate #825 when pledging to keep Comal helping Comal. Bianca’s story highlights just one of many programs and agencies that are Partnered with United Way of Comal County. Family Promise of Greater New Braunfels is a faith-based comprehensive shelter program that helps families with children overcome homelessness to achieve and sustain independence. Through holistic case management, participants emerge with a comprehensive set of life skills to fashion a successful life for them and their children. Bianca, a single mother of two young children, developed the necessary skillset for success during her time at Family Promise. In addition to learning budgeting, resume building, interviewing, and parenting skills, she also learned valuable soft skills such as how to think outside of the box, how to motivate others; how to avoid power struggles and elicit best performance. 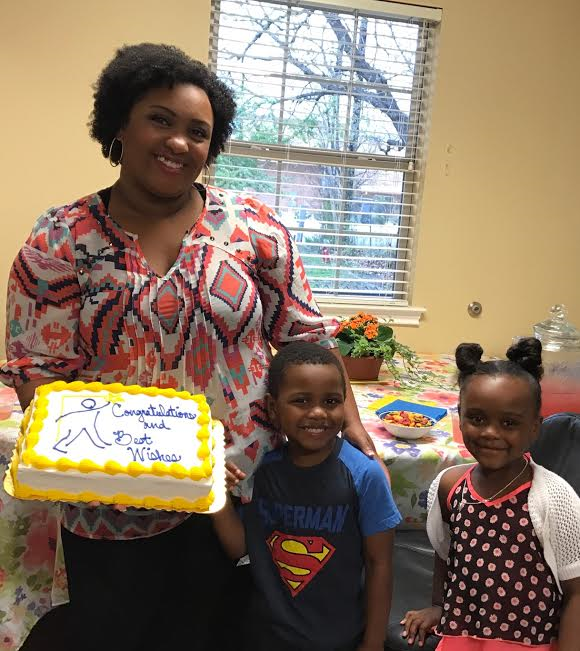 As she celebrated these achievements, Bianca credited Family Promise staff for modeling these professional behaviors in their daily interaction with her. Soon after completing the Family Promise program, Bianca faced an opportunity within her company to help overcome turnover, absenteeism, and failed inspections utilizing professional skillsets learned. Her new model was a huge success. It saved her employer significant expense in goods, fees, and absenteeism. It boosted staff morale by providing accountability and initiative, all things Bianca learned through her hard work at Family Promise. The ripple effect was embraced by other departments and caught the attention of her manager who nominated Bianca for General Manager training. Fast forward…Bianca won the nomination and is currently enrolled in the company’s General Manager training program. Family Promise of Greater New Braunfels is proud to be associated with her personal and professional success. In speaking with Bianca, she said that she “never thought she could break out of the cycle of poverty.” Bianca felt she had already won with the pride and self-confidence she regained during her time at Family Promise. Our community can be proud of Bianca and the success she has achieved. With guidance from Family Promise, Bianca has put in the hard work. However, there are many hands that have touched her path… from someone donating a vehicle to assist with daycare and of course the Family Case Worker‘s direction day in and day out. Bianca explained that Family Promise helped her realize that she needed to put her and two children first. “Once I started focusing on me and my kids, everything else started falling into place.” Sometimes the catalyst in creating change is believing in someone and helping them believe in themselves.